Global Ministries is partnering in a project to rebuild the Centennial Secondary School (high school) in Mattru Jong, Sierra Leone. The project is being spearheaded by two groups: the Centennial alumni association (many of whose members now pursue professional careers in the States, Canada, the United Kingdom, and other countries), and the Lehigh Valley (Pa.) chapter of Engineers Without Borders. Before the civil war of the 1990s, Centennial was a United Brethren boarding school with 600 students. But rebel troops occupied and ravaged the school during the 1990s, dismantling the plumbing and electrical systems for their salvage value, and destroying the water, sanitation, and electrical systems. This project will rebuild the infrastructure of water, sanitation, and electrical systems. To get things going, they are looking for 300 people/groups/churches to give $100 or more, with the goal of raising $30,000. That will enable them to get moving until grant requests are acted upon. On September 26, Faith United Brethren Church climaxed its month-long family celebration with the all day ”Family day” program. The first Sunday in September focused on the role of the mother, the second Sunday on the role of the father, the third Sunday on the role of youth, and the fourth Sunday–Family Day–on the role of the family. Family Day began with a special 9 a.m. service where Pat Eves-McKenzie delivered an inspirational sermon on the role of the family. After the service, all participants attended a special Sunday school which looked on issues relating to married couples and single people. 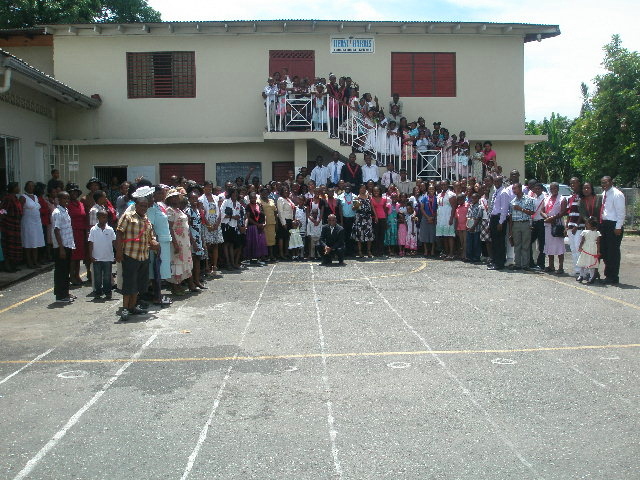 The 203 strong attendance then congregated outside to take the group picture for the 60th anniversary magazine. We then enjoyed a wonderful dinner together after which all enjoyed a spirit-filled concert which displayed the variety of artistic gifts God has blessed us with. The Institute for TESOL Studies at Huntington University has signed a five-year agreement to continue training English teachers in Doumen, a city in China’s Guangdong Province. Since 2007, Huntington University has provided a three-week training camp to English teachers currently in the country to help them better teach the language. The camp trains approximately 80 teachers each summer and also offers a two-week English camp for children. The children’s camp provides valuable practice time for the teachers. The five-year contract, which begins in 2011, allows ITS to consistently work with the Doumen School District in the southern Guangdong Province of China. The relationship will hopefully open doors for an educational exchange between the schools in China and the Huntington County school system, as well as opportunities for Chinese teachers and students to study at Huntington University. “It gives us the opportunity to plan for the future in ways that are strategic for the training that we deliver and the cultural exchange that we hope to foster,” Fetters said. Even though Huntington University’s relationship with the Chinese schools began in the early 1990s, the teacher training camp was not officially offered until 2007. 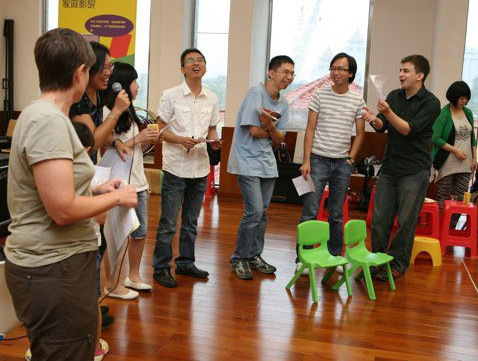 Valerie Geer (right), associate director of ITS, has been involved each year in the teacher training camps in China. Through ITS, a group of Huntington University and community educators, along with HU students and other volunteers, travel to China each summer to provide professional development to Chinese teachers who teach English in those schools. The students and other volunteers then help operate the children’s camp which teaches the children English through lessons and other fun activities. ITS was established by Huntington University in 2009. The program offers certification to students as well as local teachers. On August 15, after the morning service, the congregation of Liberty UB (Stockport, Ohio) adjourned to Wolf Creek. There, 14 persons were baptized. 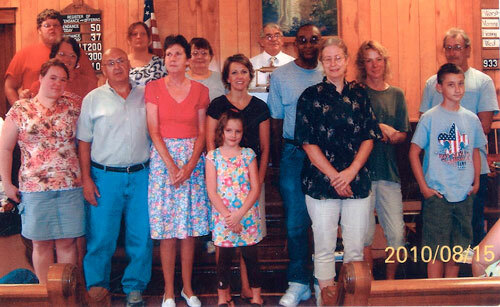 All 14 are pictured above, along with Pastor Charlie Simmons (in the middle in the back, wearing the white shirt). Huntington University will celebrate its homecoming weekend October 1-2. This year’s theme, “Celebrating the Arts — HU style,” is in honor of the 20th anniversary of the Merillat Centre for the Arts. David Moss, Class of ’83, will receive the 2010 Distinguished Alumni Citation. He is being given this award because of his mission field work in Sisak, Croatia, teaching the young men of that city about baseball and the love of Christ Jesus. Andrew Hoffman, Class of ’03, will receive the 2010 Young Alumnus Award. As the executive director of NeighborLink Fort Wayne. Nancy Hull, Class of ’74, has been named the 2010 Alumnus of the Year. Hull is fully committed to the advancement of the literary field through her active involvement in the Youth Writing Festival and the Festival of Faith Writing at Calvin College, where she is an assistant professor of English. Also included in the weekend’s itinerary will be several events for people of all ages, including athletic events, theater performances and a parade. Then wrapping up the weekend’s schedule will be Davis Hall Follies, to take place in Zurcher Auditorium. Men’s soccer game against Taylor University at 3 p.m. The Davis Hall Follies, 7 and 9:30 p.m. in Zurcher Auditorium. 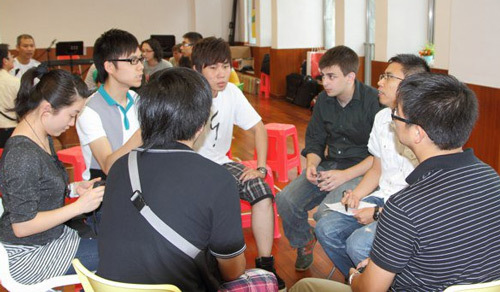 Last Sunday, Living Water and Living Stone (the two UB churches in Macau) came together for an all-day, joint service. We played a few games and ate lunch before moving into a more traditional worship service. Members from both churches took part in leading worship. Pastor Ajiax Wu from Hong Kong gave the message. Afterwards, members from both churches shared about their vision for what the UB church could do in Macau, and David Kline concluded with a call to action. We broke up into small groups and had some wonderful discussions about the future of the UB church in Macau and the importance of having everyone be a part of it. It was a wonderful time of sharing, and it was very encouraging to see how well the two groups got along. I was in charge of the opening ice-breaker. Everyone was asked to write their name on a card upon entering the church. The cards from Living Stone were put into one hat and the cards from Living Water into another. Each person then took a card from the church they do not attend. Assuming the identity of the person on their new card, each person went around the room learning everything they could about “themselves” by simply talking to others in the room. At the end of the alloted time, a few members came up to share everything they had learned about their new identity. It was amazing (and funny in many cases) to hear how much people could learn about someone in such a short time. A work team will be headed to Haiti in early October to help close in the Delmas 33 Church that has been central to much of our rehabilitation efforts since the earthquake. The team will consist of twelve Canadians and one Honduran. 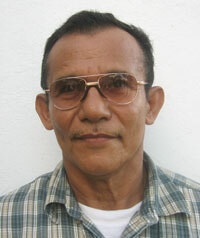 Pastor Ruben Ponce (right) is being sent and fully supported by the Honduran National Conference. He serves a local church and also is a skilled carpenter. Efforts to rebuild more churches this October have been hampered by a number of factors, and so our plans to deploy more teams have had to be put on hold. The Canadian team will work to resolve some of these issues while they are in Haiti. We hope to announce dates for a late spring, early summer project following their return. Franklin Graham shares an update of what’s been happening to provide housing and safe sources of water since the earthquake of January 2010. Global Ministries has a strategic partnership with Samaritan’s Purse, the organization he heads. Elva L. Whybark Armitage, 92, passed away Sunday, September 19, 2010, in Lewiston, Idaho, from complications related to cancer surgery. For 56 years, she was married to Arly Whybark, and for 37 of those years, they pastored United Brethren churches in northern Idaho, Washington, and Oregon. Elva was active in the various Women’s Missionary Societies, often serving as president. Arly passed away in 1989. In 1990, she married Rollin Armitage; he passed away in 2002. She was most recently a member of the Lewiston First Church of the Nazarene. A memorial service will be held at 11 a.m. Thursday, September 23, at Malcom’s Brower-Wann Funeral Home of Lewiston, Idaho. On Saturday, September, 18 Morocco UB church (Temperance, Mich.) held a Family Fun Fest, for which they invited church families and the community to a outdoor festival setting. A worship team from Abundant Life in Temperance performed. The event included a lot to eat–cotton candy, snow cones, popcorn, funnel cakes, hot dogs, brats chips, and beverages. There were games for the kids.